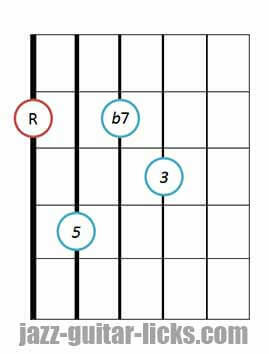 Dominant 7th chords are made up of a root (1), a major third (3), a perfect fifth (5) and a minor seventh (b7). 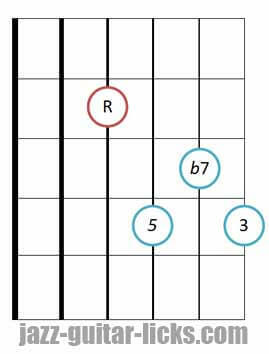 This is a basic major chord with a minor seventh added. 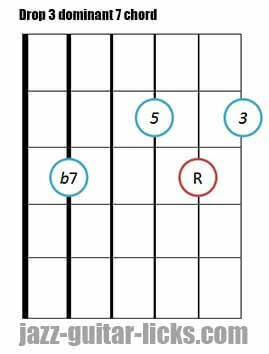 Keep in mind that it is very important to make the difference between minor 7th, major 7th and a dominant 7th chords. 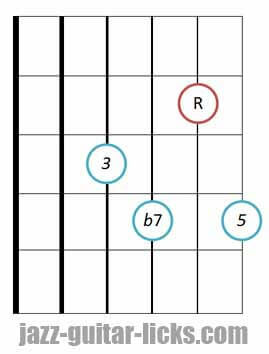 Major 7 chords contain a major third and a major seventh. Minor seventh chords, a minor third and minor seventh. 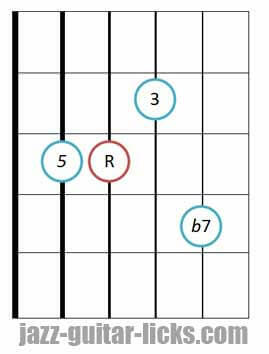 Dominant 7th chords have a primary place in many jazz chord progressions (I-VI-II-V, III and VI-II-V or II-V-I) whose role is to drive to or resolve to the tonic note or chord. There are also obviously present in blues progressions on each degree (I-IV-V). Basically, dominant are chords with just a number, without any “major” or “minor” definition. For example, C dominant 7th will be written "C7". 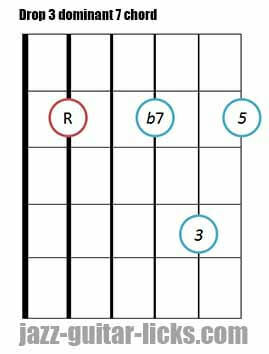 What Are Drop 2 Voicings ? 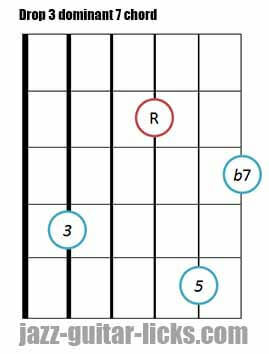 Drop 2 chords are the most popular chord voicings used in jazz guitar. They are usefull because they don’t stretch your fingers too much.They are built by dropping the second highest note of a four-notes close chord to the bass. 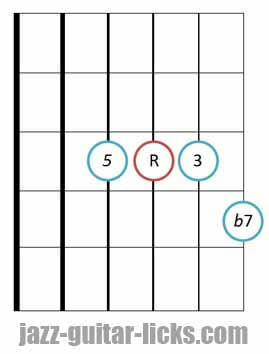 Dominant seventh close chord formula is 1-3-5-b7 that gives the following drop 2 chord formula 5-1-3-b7. The root of an inverted chord is not in the bass. In other words, it means that the notes of a chord are inverted. As you can see in the guitar diagrams above, there can be a third, a fifth or a seventh in the bass. There are four dominant 7th voicings in it. The first correspond to the root chord. It has its root (R) on the sixth string. This is not a "close position" but an "open position". Dominant 7th close positions (1, b3, 5, b7) are quite difficult to play because they require an uncomfortable finger placement. Then, you can see three inverted chords related to the root position. (The notes of an inverted chord are simply played in a different order). The first inversion has the third in the bass. The second inversion has the fifth in the bass. The third inversion has the minor seventh in the bass. 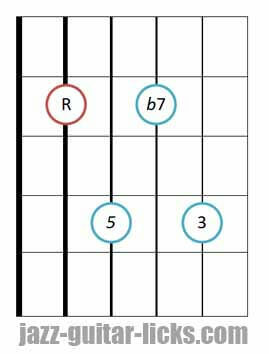 Check out the three diagrams below, they show how top play the four dominant 7 drop 2 voicings on guitar. Each voicing has an assigned colour. Black for the root position, blues for the 1st inversion, red for the 2nd inversion and green for the fourth. These chords are named drop 3 because the 3rd note in a closed voicing has been “dropped”. They are built by taking the 3rd highest note in a closed position chord and lowering it by an octave. 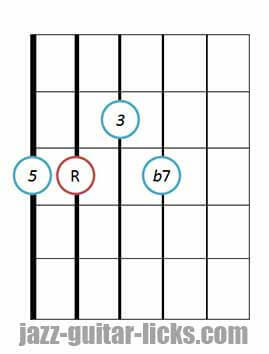 Here are four drop 3 dominant 7 voicings related to the eight guitar diagrams below. 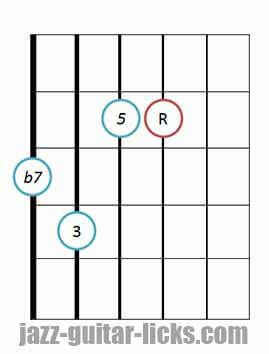 Here are four drop 3 dominant voicings with the lowest note on the 5th string. The black notes correspond to the root voicing, the blue notes to the 1st inversion, the red to the 2nd inversion and the green show how to play the 3rd inversion. 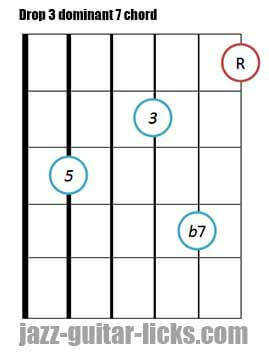 The next guitar neck diagram shows how to play the four dominant seventh drop 3 voicings with the lowest notes on the E string. Drop 2 and 4 chords are very important tools for arrangement, composition and can be useful for chord-melody playing. Drop 2-4 voicings are built by dropping down an octave the second and fourth note of a tetrad chord in close position. The two guitar neck diagrams below show the four dominant 7 drop 2-4 voicings. The root voicing is represented by the black dots, the first inversion by the blues dots, the second by the red dots and the third by the green dots. 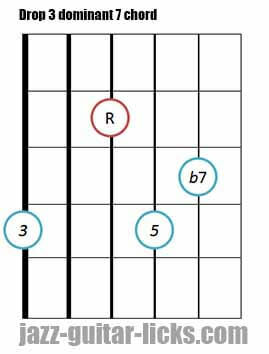 Here are some scales to play over dominant 7th chords when you want to improvise. 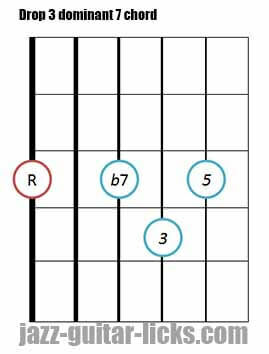 This is the first and ideal mode when you want to improvise over dominant 7th chords. This the fifth mode of the major scale. As its name implies, this is the fifth mode of the harmonic minor system. It has a minor second (b2) and a minor sixth (b6) in comparison with the mixolydian mode. 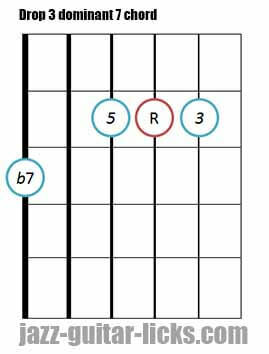 This is the fourth mode of the melodic minor scale. It has a raised fourth (#4 or #11). There are two dominant modes in the melodic minor system. Here is the second. This scale is widely used by bebop players. 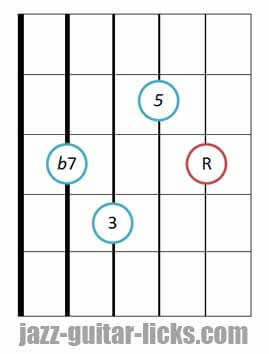 It has the same notes as the mixolydian scale, including a major seventh (7), chromatic passing tone between the minor seventh (b7) and the root (1). 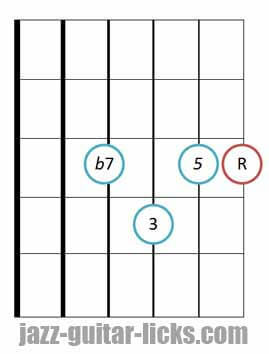 This scale can also be named Mixolydian blues scale or mixo-Dorian blues scale or even Mixolydian / blues hybrid scale. 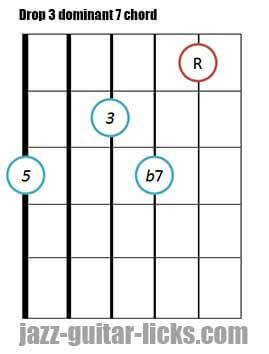 Anyway the result is the same, this scale is a combination of the minor blues scale and the Mixolydian mode. It is built by alternating half-steps and whole-steps. 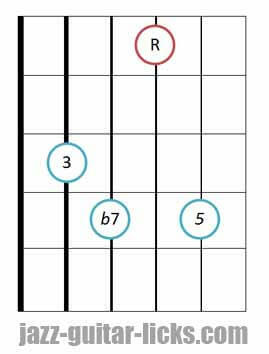 This scale is usually used by jazz musicians to solo over dominant 7th chords, particularly 7b9 chords. It brings interesting tensions by highlighting the b9, #9 and #11.